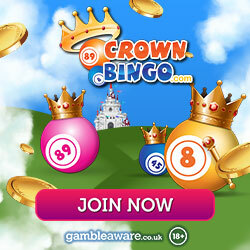 Crown Bingo is throwing a huge Summer Party worth £100,000 on 28th August. This is the last Sunday of the month so the Super Bingo Linx will also play, this game comes around just once every month and offers £10,000 so be sure to catch this game on the night. The fun begins at 6pm on the day where you can enjoy the many bingo games in the 90 ball rooms, Rooms 1 and 2 and the Bingo Studio Live. There's a gigantic £100K up for grabs in just 6 hours so this is one party, you cannot afford to miss. Pre-buy your tickets now and you will be bale to take advantage of £500 guaranteed games, special 1TG and 2TG games, £2K Games and Grab a Grand Games, not to mention the Super Bingo Linx. New members who join this bingo site will get a free £1 no deposit bonus to enjoy a few free bingo games before they commit to a deposit. First deposits are met with a bonus of 100% up to £50 so you can double up when you fund your account for the first time.